This update fixes a bug where Automatic Breaks were being applied more than once. ‣ Now optimized for the new edge-to-edge display on the Apple Watch Series 4. ‣ Track time at a glance using the new Infograph Complications on your watch face. 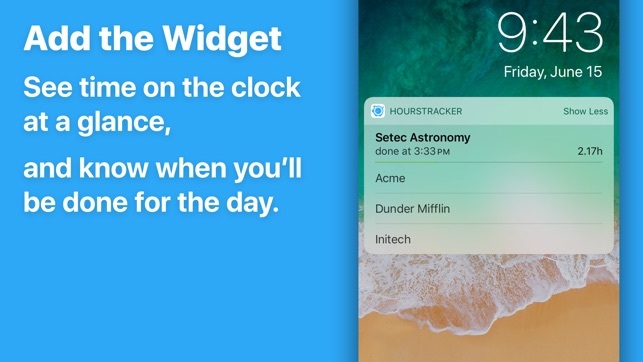 ‣ Added support for Siri Predictions. ‣ Fixed a bug where the time picker would show AM/PM time when 24-hour time is preferred. ‣ Fixed a bug where the Export screen would not save the selected “export start/end times” setting. ‣ When “Export Earnings” is turned off, time entry earnings adjustment amounts will no longer be included in the export. Update: One thing I do wish was possible is to edit tax rate on existing jobs. I have 2 pay periods worth of jobs and realized I miscalculated the tax rate (put 6% when it’s actually around 21%). But it seems the only way to fix this is to make new jobs for each of those days with the updated percentage. There’s an edit function, but it doesn’t include the tax percentage. Keep this updated! One of the most helpful apps I’ve ever had! 😃. 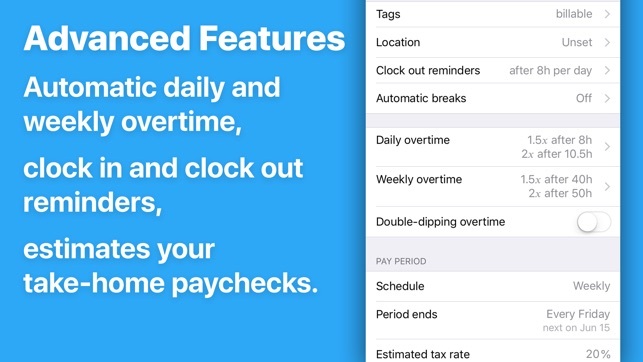 Takes a little bit of set up to get tax rates, overtime and double time programmed, but after that it’s as easy as punching in your clock-in/clock-out, adding your breaks and other details if they are relevant, and then it gives you a pretty accurate approximation of your net income. Really nice to be able to see what I can expect on my next check without having to do all the math myself. 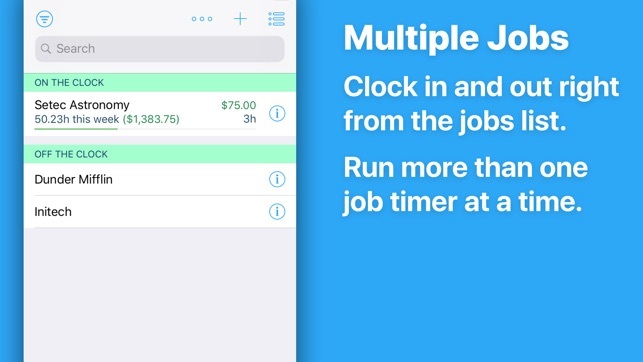 Free version gives you 3 “jobs” (or if you’re an hourly employee, these would work like hours per day. 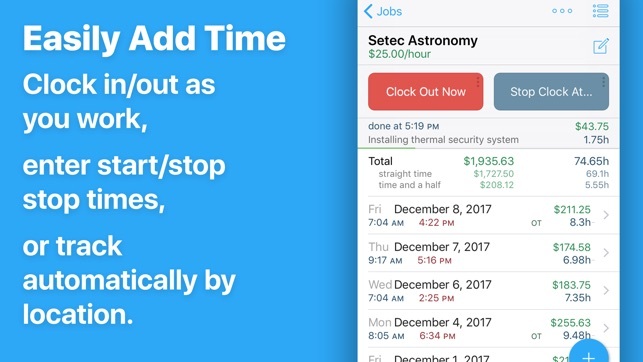 The paid version, which is $10, gives you unlimited jobs/days, and it keeps them categorized by days, weeks, months, so you can get an overview of how many hours and how much you’ve made total in those categories. I’m finding it well worth the price. 1. 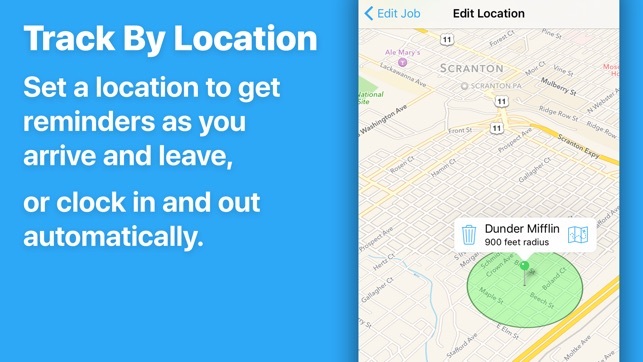 Tap the pencil icon to the right of the job's name on the job's details screen to edit the job. 2. Scroll down. The tax percentage is near the bottom of the Edit Job screen. 3. Tap the Done button in the upper right corner when you are finished editing the job. Note, the new tax rate will be applied to every pay period for that job, including ones in the past. If you want to have a new tax rate that only applies going forward, then you would want to create a new job with that rate, and then track the new time entries under that job so that the existing pay periods can remain as-is. The best way to create a new job that has the same settings as an existing job is to use the Copy Job function. 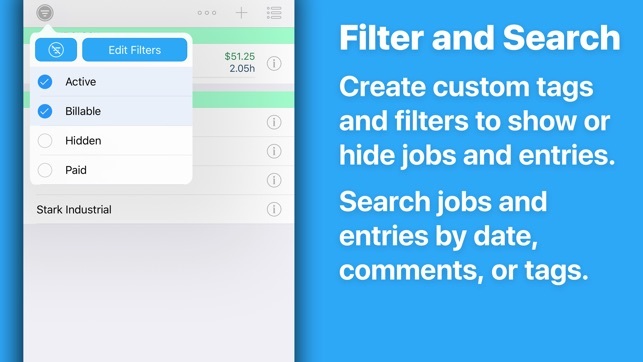 From the Jobs list, swipe left on the job you want to copy, and then select the Copy button that appears on the right side. I don’t usually take time out of my day to review apps, even the ones I really like. But, I have got say that I am more pleased with the functionality of this app than any other I have purchased - across the board. I am attorney with many different clients and need to record everything I do every day for each. Most commercial, legal-oriented timekeeping software is very expensive and more than I need as a solo practitioner. This app allows me to clock in and clock out on my phone wherever I am, which results in an extremely accurate reflection of what I did during the day. Exporting the results to an Excel spreadsheet allows me to keep a permanent record of my time, down to the minute, which is perfect for those times when a client may question a particular bill later on. I know exactly how much time I spent on a phone call or preparing a brief or other documents, and it is very easy to go back and check. In Excel, of course, I can then sort by date and client, and prepare any invoice with a simple cut and paste. The app has other bells and whistles that I don’t need, but, for the price, I couldn’t be happier. 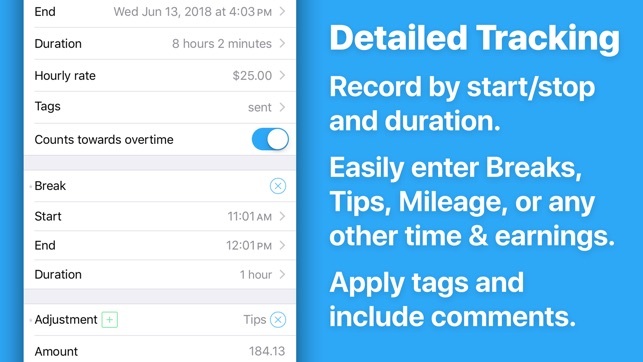 This is my first time using an hour tracker app and I'm very picky on what I choose to use on just about anything, but I can say that this app is easy to comprehend, I like the fact that it includes your estimated tax rate percentage and any, if any deductions are made to your check. It shows you how much you have made daily, weekly, monthly, and yearly on the amount of entries you input which I consider to be very helpful, but I would love it if it would also break it up into how your (the user) pay periods work, this is the reason I gave it 4 stars. 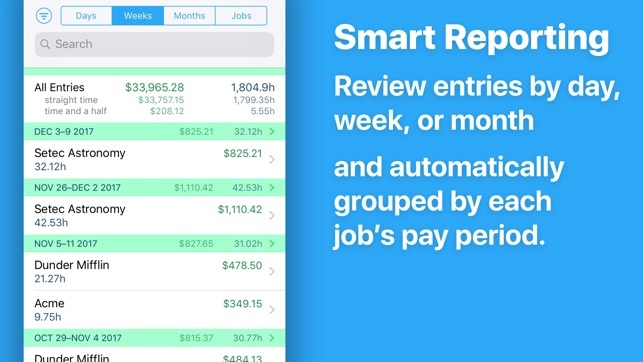 On the bottom section where the tab that says Jobs, if you could please update it to where when your pay period ends, the app provides a horizontal breaker line to separate all the entries from the past pay period, that way it's doesn't seem all crowded. Nonetheless this app deserves 4 stars and a half, but Apple Store does not allow me to put that in. 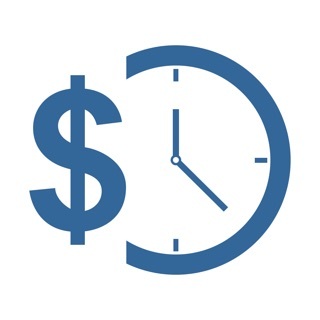 Very great app to track your hours and pay.